Short for electrostatic discharge, ESD is one of the few things you can do to damage or destroy your computer or parts in your computer. Like the shock you receive when rubbing your feet on the carpet and touching something metal, ESD can occur when working in your computer and can cause damage to components. ESD can occur without you feeling a shock and only occurs while working on the inside of the computer or handling an expansion card or other hardware. 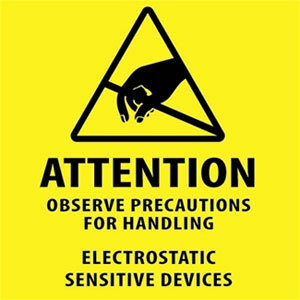 The best method of preventing ESD is to use an ESD wrist strap, grounding mat, or grounding workbench. However, because most users do not have access to such items, we have included the steps below to help reduce the chances of ESD as much as possible. Tip: If you plan on working on the inside of the computer more than once, we highly recommend purchasing and using an anti-static wristband. Zero potential - Most importantly, make sure you and the computer are at zero potential by continuously touching an unpainted metal surface of the chassis or the computer power supply case. Standing - Always be standing when working inside the computer. If you are sitting on a chair or the floor, it can generate more electrostatic. Clothes - Make sure not to wear any clothing that conducts an electrical charge, such as a wool sweater. Weather - Electrical storms can increase the ESD risk; if it can wait, try not to work on a computer during an electrical storm. Accessories - To help reduce ESD and help prevent other problems, it is also a good idea to remove all jewelry. Surface - You should be standing on a hard surface, and the computer or other electrostatic sensitive devices should be on the table. When working inside the computer, you should have at the very least a wrist strap to help protect the sensitive components from ESD damage. If you run a business that deals with lots of sensitive equipment a grounding mat and even a grounding table is also highly recommended. 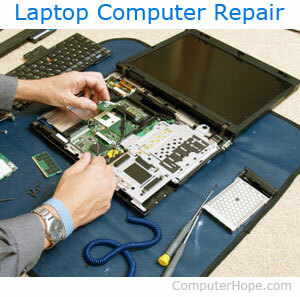 See our tools definition for a listing of other computer repair tools. Below is a listing of other ESD related terms found in our computer dictionary. If the computer no longer boots after working inside of it, try the below recommendations. If you have added any new parts, remove them and try to boot the computer again. If the computer boots, the part was either not connected properly or incompatible with the computer. Try it again to help verify. If the computer still does not boot properly after removing all new hardware or you did not add new hardware, make sure all cables and expansion cards are connected in the computer. Make sure each expansion card is seated firmly and not partially seated. Unfortunately, if the computer still does not properly boot, something may have been damaged and is causing it not to work. If the computer is beeping abnormally, refer to our beep codes page for recommendations and beep code listings. See our POST troubleshooting page for further information on troubleshooting a computer that does not boot.